Listen to my interview with Brian Nelson, author of The Silence and The Scorpion, here. Quico says: Seven years on, the events of April 11, 2002, haunt Venezuela as much as they ever did. The drive to mythologize the April Crisis began as soon as it ended, and the more time passes, the less we seem to know about what really happened. A government heavily – indeed, literally – invested in reinventing the coup as an epic struggle against imperialist aggression has enveloped the events of April in layer after layer of systematic forgetting, a carefully orchestrated campaign of deception that has been, in the grand scheme of things, brilliantly executed and shockingly effective. 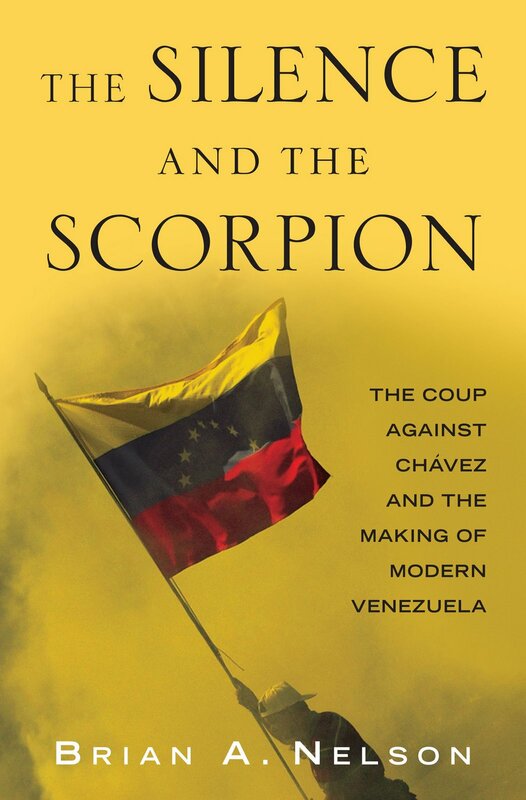 Brian Nelson’s remarkable new book, The Silence and The Scorpion: The Coup Against Chávez and the Making of Modern Venezuela (Nation Books, available for pre-order now, shipping from Amazon on May 4th) is the antidote to this corrosive form of engineered Alzheimer’s. Easily the most complete version of the April Crisis available in print, The Silence and The Scorpion is a minutely (one is tempted to say “obsessively”) researched account that brings together the stories of the coup’s main movers and a number of its bit players as well. Basically, Brian spent six years watching every bit of footage of the coup, examining every available photograph, going through every scrap of written testimony and interviewing as many key players as possible. Then he wrote it all up. He shouldn’t have had to. This ought to have been the Fiscalía’s job, and the Defensoría’s. But the chavista state’s oversight bodies have steadfastly denied the country a reality-based account of what really happened that weekend. The organs of official memory have been turned into state rohypnol. Somebody had to fill the gap. And now, someone has. The result is an enthralling read. Pitched at a general audience, the book is shot through with vivid details and strewn with telling and yet all-but-forgotten pieces of the April Puzzle. This week, Brian was kind enough to answer some of my questions about his book. We talked about Luis Fernández – the Venevisión cameraman who got the key footage of the Llaguno Overpass gunmen – about the sequence of deaths on Avenida Baralt, about Lucas Rincon’s role that evening and late night, about the use of lipstick as face-paint, and much else besides. You can also download the MP3 file (25 Megabyte) here. It’s 36 minutes long. The second half of this broad-ranging interview will be available tomorrow.